I am happy that all the recruits to LMRC are presently undergoing training at the Centre of Excellance for Training (CoET) at Transport Nagar Metro Depot. You will be glad to know that the Board of Directors of Lucknow Metro Rail Corporation (LMRC) under the chairmanship of Shri Durga Shankar Mishra, Secretary, (MoHUA), Govt. of India has approved reconstitution of Lucknow Metro Rail Corporation as Uttar Pradesh Metro Rail Corporation..
Lucknow Metro Rail Corporation (LMRC) has achieved another major milestone in underground Metro construction when TBM Gomti successfully made tunnel below the Haider Canal Bed on approach of Hussainganj Metro station of Lucknow. Lucknow Metro Rail Corporation (LMRC) has achieved another milestone towards openning services for public operation by achieving the technical clearance of its rolling stock. The completion of oscillation trial by the Research Design and Standards Organisation (RDSO) much before their scheduled target date is a very welcome and positive move with regard to commissioning of Metro train services for the public. 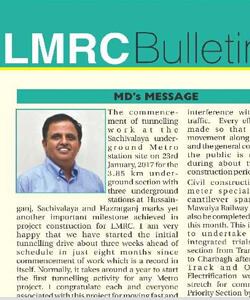 The commencement of tunnelling work at teh Sachivalaya underground Metro site on 23rd January 2017 for the 3.85 km underground section with three underground stations at Hussainganj, Sachivalaya and Hazratganj marks yet another important milestonre achieved in Project construction for LMRC.